There’s been a lot of discussion lately about China’s growing economic challenges and what two clearly authoritative commentaries that appeared in People’s Daily—one here and also a January speech by President Xi Jinping that finally appeared here—actually mean for those problems. For many analysts, these twin events signal deeper dissension in Beijing, and yet another sign of crisis for the country. In short, the usual themes of “China is at the crossroads”; “China’s approaching a crisis”; “the Chinese collapse is around the corner”, “economic forces that are about to burst forth and bury the Chinese government”; or some such unhappy tidings and predictions. The common thread in all of these forecasts seems to be, as ever, that “China can’t hold on much longer”. Except China always does. Beijing either solves the problem—somehow—or keeps getting away with not doing so. The reckoning that so many talk about seems to get postponed, or really wasn’t a reckoning to begin with. Leaving aside for the moment why that’s been the case (as well as why those predicting doom for China are like meteorologists on meth and never held accountable for their missed forecasts), what’s happening here? The appearance of the summary and Xi’s speech are noteworthy, to be sure. But they’re not purveyors of good or bad economic news in themselves, so much as another chapter in the larger political challenge of getting Chinese officials to make up their mind which policies—and which person—to support, and what happens when they don’t. That both the commentary and Xi’s speech were featured on successive days in People’s Daily is evidence that there’s a high-level debate in China about what’s wrong with the economy. The challenges that are identified in the pages of People’s Daily (as well as its website) are always ones that leading Communist party members think need attention. After all, the newspaper is a codebook for cadres--for party officials to dispense information and to establish direction, as well as seek feedback. Cadres dissect the paper (and increasingly its website) for clues about discussions, debates, and directions in policy. (When they’d fail to do so, they’re chastised.) Therefore, printing and positioning both of the pieces noted above with such prominence is significant because it’s a well-defined attempt by the leadership to highlight their current thinking about China’s economic problems. While the two pieces can be thought of as a set, it’s more useful to unpack them. The “authoritative commentary” that graced the front-page of People’s Daily and occupied the entire second page in this past Monday’s edition is a laundry list of the low-lights of China’s economic performance. It’s very much a summary--representing the current consensus in Beijing that what worked for China before isn’t working so well now. The commentary captures the current condition of China’s economy affairs, which is clearly not very good or very promising. But while the piece outlines the parameters and the goals of economic policy, it doesn't specify remedies. Xi’s speech is a very different document. The speech is really a dissertation of China’s economic development and the progress made by other countries by which Beijing has often measured itself (parts of which are clearly drafted by advisors, probably from outside). The speech is also an attempt by Xi to describe how China got to where it is presently, an effort to explain his own thinking about China’s options. At the same time, the tone of Xi’s speech (or talk or presentation—it’s not entirely clear what, and some of it reads like a pastiche) is rather wary--of explaining why certain decisions were made and describing where matters are now. Indeed, the document reads as somewhat self-justifying; as if Xi has been asked to defend why China’s economic circumstances are where they are and what they are presently. And thus we get to the part about why these “authoritative commentaries” are ultimately about politics. Xi probably adopted this protective posture because he’s not been at all comfortable talking about economic matters, except in the most general terms. For economics and finance are really Premier Li Keqiang’s realm, and there’s already tension between Xi and Li (actually, for some time now) because while Xi and Li aren’t in a struggle for power (both already have power), they are competing intensely over who offers the better solution for China. There’s Xi’s vision, which prescribes ideology as the cure and reconnecting the Chinese State to the Chinese Society through party reform. Then there’s Li’s notion, which insists that the government’s ability to rule rests largely on Beijing’s successful management of the economy. 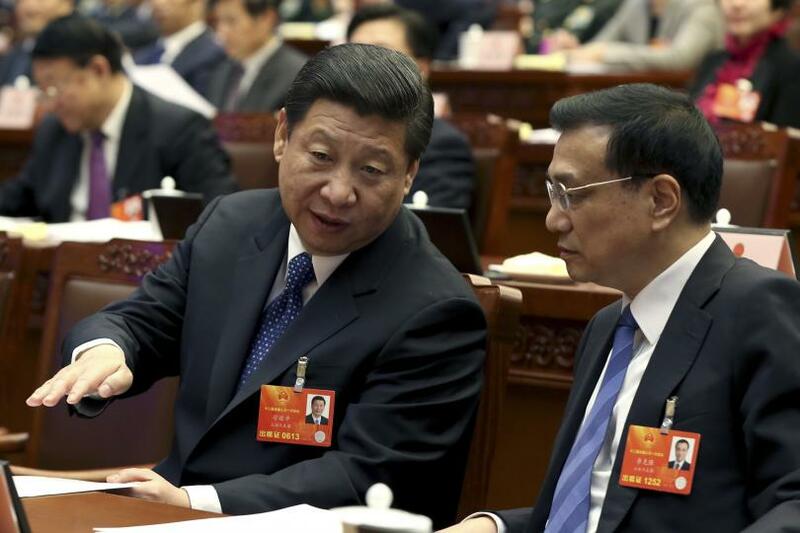 This tension isn’t a partition of responsibilities as it was under Xi’s and Li’s predecessors, but a real divide which many officials—national and local--have been suffering with for a while now. It’s becoming very tough for bureaucrats in Beijing and cadres in provinces and localities to know how to act--what projects to move forward with; which ones being discussed should be abandoned; and whether the anticorruption campaign will continue or finally be called off. As important as Xi’s crusade against graft had been in caging “tigers” (high-level officials), the uncertainty it created at lower levels often put a stop to local initiatives for fear that cadres there would be labeled as corrupt “flies”. So when local officials look at Beijing and see Xi focusing on political discipline and loyalty, while Li is emphasizing administrative efficiency and fiscal reform, they’re confused at what they themselves are supposed to be doing. The result of this political divide between Xi and Li is a stubborn paralysis in local policymaking. What’s needed isn’t so much another economic stimulus package, but a political jumpstart. The only way to achieve that outcome is for either Xi or Li to win the argument. But, right now at least, China and its cadres are left with two documents, articulating two different descriptions, and each side looking to solicit the views of officials in an effort to break the policy impasse. There’s no clear winner and no well-defined way forward, at least where economic reform is concerned.